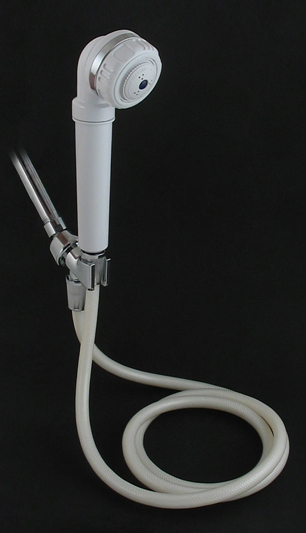 Above, the basic filter body of the Sprite Hand-Held Shower Filter. The elongated filter cartridge, pictured below, is contained in the handle. We've been selling Sprite's High Output Shower Filter for a number of years. It has been an extremely popular product with our customers, so for some time we resisted the temptation to offer other shower filter styles. Shower filters, frankly, can be a pain for the seller, because premature clogging and flimsy body design often lead to high rates of returns from customers. We've had neither of these problems with the High Output. Customer satisfaction is very high and returns are rare. We've added the Sprite Hand-Held Shower filter to meet both these needs. 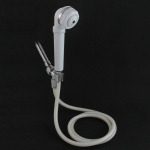 Its long hose allows Mom simply to remove the shower head from its carriage and lower it to fill the tub for the kids. And Dad will be overjoyed to stand up straight in the shower, because the head level is actually several inches higher than with the High Output or other conventional filters. Best of all, the Hand Held uses the same unique KDF/Chlorgon filter medium that has made Sprite's High Output system so popular. And it is made with the same top-quality materials and workmanship that make the High Output system such a trouble-free and durable performer. Note! The Hand-Held system uses a smaller filter cartridge than the High Output and you should change cartridges more often. Sprite recommends changing at three-month intervals. The shower filter comes with a single cartridge installed. If you want additional cartridges, order the optional cartridge pack, which contains two replacements. Cartridges are sold only in two-packs. Replacement is very simple. The filter handle opens easily for cartridge replacement. Go here for full installation, maintenance and cartridge replacement instructions. 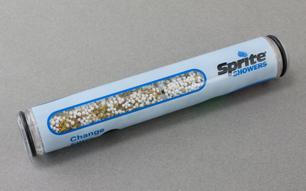 Sprite Shower Filters feature replaceable cartridges with Sprite's exclusive ShowerX Filtration Technology for NSF Certified reduction of free and combined chlorine. We carry replacement cartridges for additional Sprite filter models on our Sprite Cartridge Page.